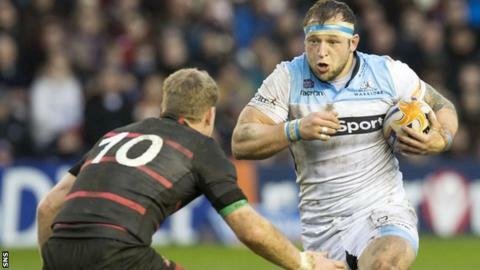 On Saturday evening at Scotstoun, Glasgow Warriors will host Edinburgh in a Scottish derby in the Pro12. It will be trumpeted as a great local rivalry, but the reality is that these two clubs can be bracketed together only by geography. In the way they are performing on the field, and off, they are worlds apart. Glasgow operate on a different plain. They have just won five games in a row in this competition. A week ago, they turned over Heineken Cup semi-finalists Munster in Limerick and followed it up by beating Heineken Cup quarter-finalists Ulster in Glasgow. That is one hell of a double over two of Europe's finest outfits. Warriors are fourth in the Pro12 and are pushing for a home semi-final in the play-offs. Edinburgh are a distant eighth. Their hopes of making the top four died long ago. Alan Solomons, the Edinburgh coach, has also given up on making the top six. He has conceded that they will not qualify for the new European Champions Cup next season. Gregor Townsend, his Glasgow counterpart, has got the balance just right between home-grown players and imports who do not just take a pay cheque but also make a difference. They have some key foreigners in their ranks, but are unmistakeably Scottish in their make-up. They have some terrific Scottish prospects in the team or on the verge. Glasgow have got their stuff together. They have left Edinburgh behind in their slipstream. Last week, in the wake of Edinburgh's defeat by Cardiff in the Pro12, Solomons offered the opinion that his team are making good progress and are on the right track. The comments came and went and nobody really challenged him. Maybe because Edinburgh have ceased to be a factor. They are almost an irrelevance. It has got so bad for Edinburgh that even the coach's hubris is met with indifference. Last Saturday, they lost for the 12th time in the league this season. This time it was to Zebre, who are bottom of the league and who had won only three of their previous 19 league matches until Edinburgh's soft touches came to town. In other words, they have lost 63% of their games in the Pro12. They have three terribly difficult ones to play - away to Glasgow, home to Munster and away to Leinster. They need to win one of them to avoid replicating the win-loss return of last season, a rate of failure that cost Michael Bradley his job. Where, you have to ask, is this progress that Solomons has spoken about? Edinburgh live an unloved, nomadic existence. Every time you watch them play, they have a batch of players from the southern hemisphere, each one hailed by Solomons as the second coming of Todd Blackadder in terms of quality and influence, but few have lived up to their billing. Edinburgh are a pretty soulless team led by a man who is benefitting from a cosy culture at the Scottish Rugby Union. After that Cardiff loss, Solomons bemoaned the conditioning of his players. He partly put this down to the fact that he only fetched-up at Edinburgh two weeks before the beginning of the season, at which point it was too late to get his team conditioned the way he would have wanted. He pointed out that, in his previous job, as director of rugby at the Southern Kings in Super Rugby, his players were perfect examples of conditioning at its scientific best. "They are not in the same league," said Solomons, when asked to compare his new team to his previous side in fitness terms. "In that league, we had 10 games in a row, including going to Australia and New Zealand. "We went on tour and played the Crusaders then played the Hurricanes, then played the Brumbies, then played the Rebels, and then went straight back home and played the Bulls. That gives you an idea of the massively high level you are trying to play week-in and week-out. Now, in order to cope with that, you have to be appropriately conditioned and that made the difference for us." What Solomons did not mention, of course, is that his team won only one of those five games he referred to. They conceded 55 points to the Crusaders and 46 points to the Hurricanes. The last in that series, at home to the Bulls, resulted in a 34-0 defeat for the Kings, who finished 15th and last in the competition. Secondly, it was the fault of the SRU that Solomons and his battery of coaches were not around to conduct pre-season. They allowed him to stay on in South Africa for most of the summer and left Edinburgh without their top man at a time when they needed to be putting in the foundations for the months ahead. Thirdly, the Edinburgh squad that lost to Cardiff and sparked the conditioning comments contained 10 players Solomons signed. How was their conditioning? How was the conditioning of the Edinburgh team that failed so miserably against Zebre? That side had six Solomons signings in the starting line-up and another four on the bench. The truth is that Edinburgh have been a failure this season. Maybe not quite as hopeless as last season, but pretty grim all the same. If that is the progress that Solomons refers to - ie, not as bad as Bradley - then it tells you something about the Edinburgh mindset. Solomons' view is that once the squad beds-down and has a proper pre-season under their belt then they will fly. This is the kind of 'jam tomorrow' line we have heard from Scotland director of rugby Scott Johnson. Maybe he will be proved right. You dearly hope that he will be. But he doesn't half test the faith when he bangs on about the progress made this season. Mark Dodson, the chief executive, has given Solomons licence to sign almost 20 foreign players on contracts of varying lengths. Some qualify to play for Scotland, many do not. With the odd exception, they look a very average lot. It is early days, of course. But, on what we have seen so far of Solomons' recruitment technique, quality control seems to have given way to the scattergun. Meanwhile, Glasgow move forward. Fifteen wins from 19 league games. Four defeats but three of them by a converted try or less. Only one defeat by more than seven points in the entire Pro12 season. Townsend does not need to apply a Solomons-esque top-spin to that performance. It speaks for itself. On Saturday night, they come together at Scotstoun, one side in pursuit of silverware, the other trying to salvage some respect.